I spent my 2013-2014 school year of undergrad at a language school in a small French town, right next to the border with Geneva, Switzerland. During winter break, I had about a month to go wherever I wanted (and could afford). I had traveled with a group of classmates for fall break, and was really curious what it would be like to travel alone. So, I took a two-week trip by myself that brought me through five different countries. The start of the game. ALLEZ L’OL! I started off taking a train from Geneva, Switzerland to Lyon, France. 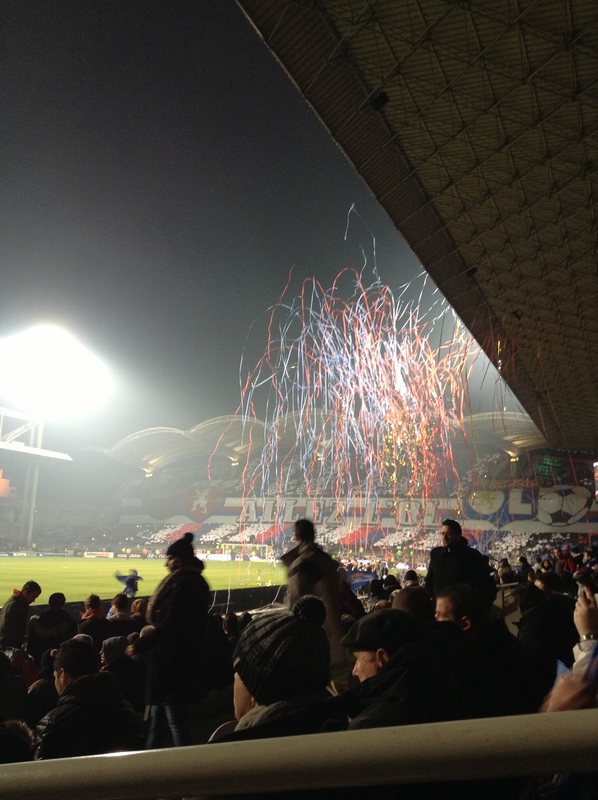 I went to a soccer match between Olympique Lyon and one of their main rivals Olympique Marseille. I sat one section over from the Ultras, which was a wild experience. Then I flew from Paris to Berlin, and resumed my travels by rail. 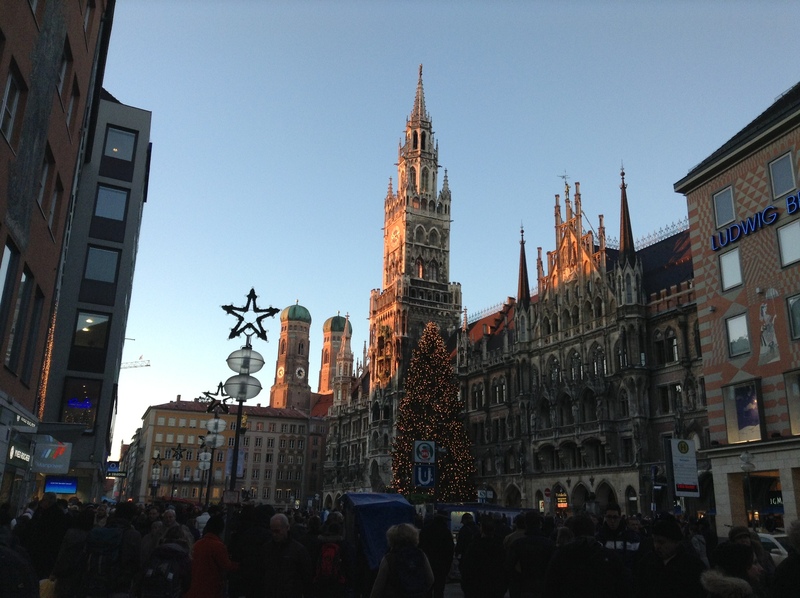 In two weeks I saw France, Germany, the Czech Republic, Austria, and Switzerland. I went from Berlin to Prague, Prague to Vienna, Vienna to Salzburg, Salzburg to Munich, then Munich back to Geneva (via Zurich). I would have to say that this trip is in my top three experiences of my life. The total landmass of the 28 member countries of the European Union is half that of the United States. I don’t think many people appreciate just how small Europe is, and how easy it is to travel- most of all, Europeans. I took an EasyJet flight from Geneva to Barcelona- round trip- for $35. I saw a last minute flight from Berlin to Brussels for NINE DOLLARS. That means for the price of a burrito and a soda at Chipotle you can fly from the capitol city of Germany to the capitol of Belgium. I can’t find a last minute flight from Phoenix to freakin’ LAX for less than $150. 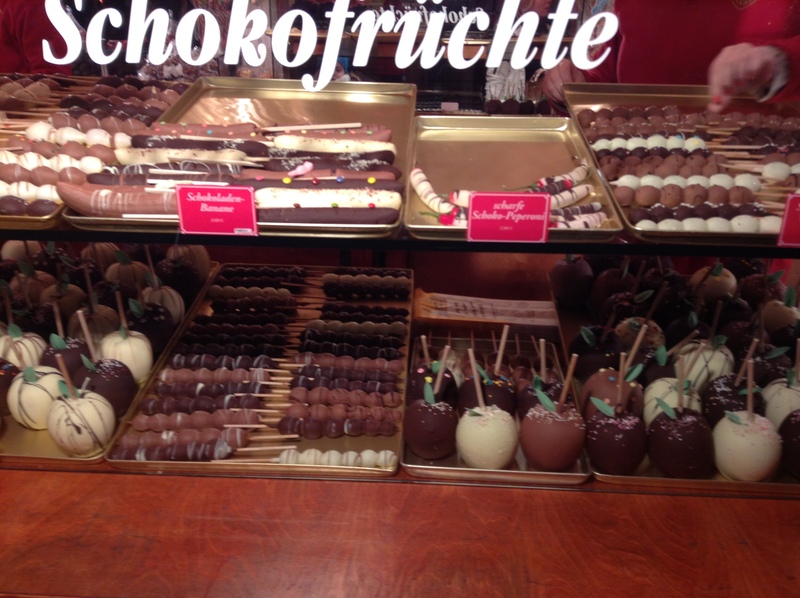 Germans will put chocolate on literally any fruit. Europe is a special place, and Eurail is an amazing thing. The railways in Europe are extensive and the trains are very comfortable. In my case, I paid about $100 to have unlimited travel for any 5 days out of a 3 week period. I gave myself some structure, and picked the cities that I would stay in, but I left the final timing completely flexible. Traveling by train is such a unique experience, and my favorite part is the scenery. Every train raid felt like a magical adventure to begin a new year at Hogwarts. I still have dreams about the Czech, Austrian, and Swiss countryside that I traveled through. The most freedom I have ever felt in my life I experienced in Austria. I had booked a hostel in Salzburg for three nights, and the morning after the third night I packed up my backpack and went to eat breakfast. After breakfast, I had such a euphoric moment. I could choose to find a different hostel for that night on the coffee shop wifi, or walk 10 minutes to the main Salzburg train station and meet up with a friend that evening in Munich. The next train was leaving in five minutes. I sat down and just enjoyed how free I felt. On a whim, I could travel to a completely different country- filled with its own history, culture, dialects of German, food (beer), and people. Jesse, Georgie, Olivia, and Sally were four friends from Wales and England who were on holiday break in Berlin. I met them one morning in the eight-person hostel room I shared with them. We got to talking before breakfast and I found out they were going to hit up the same museums I was interested in. So naturally, we spent the entire day together. From 10 AM to 3 AM (the next night) we explored Berlin and talked about the differences and similarities between Brits and Americans. I vividly remember sitting around a table in the dimly lit lobby of the hostel, with some weird and creepy instrumental synth music in the background. Jesse didn’t know that Americans still use miles to measure distance, he thought Americans had switched to kilometers decades ago. At the time it felt very natural, but looking back it is kind of weird that we, total strangers, would connect so quickly. It reminds me of how comfortable I feel around other T-birds. In Germany we were just a bunch of students who just wanted to discover new things in new places. At Thunderbird we share the same global mindset, which comes with a love for travel and experiencing new cultures. Not everyone is friendly of course. I was re-taught this lesson by a man on a train in the Czech Republic. As I got on the train, a guy stood up and started screaming in my face. In Czech. The only phrases I knew were “I don’t speak Czech”, “thank you”, and “water, please.” None of which I felt like sharing with him. I mean, this man was more doped up than a state-funded Olympic athlete from a certain Slavic country. I endured the tirade, and promptly ran to a seat. That was probably the only time I ever felt unsafe in Europe. If you ever wanted to travel on your own- do it. 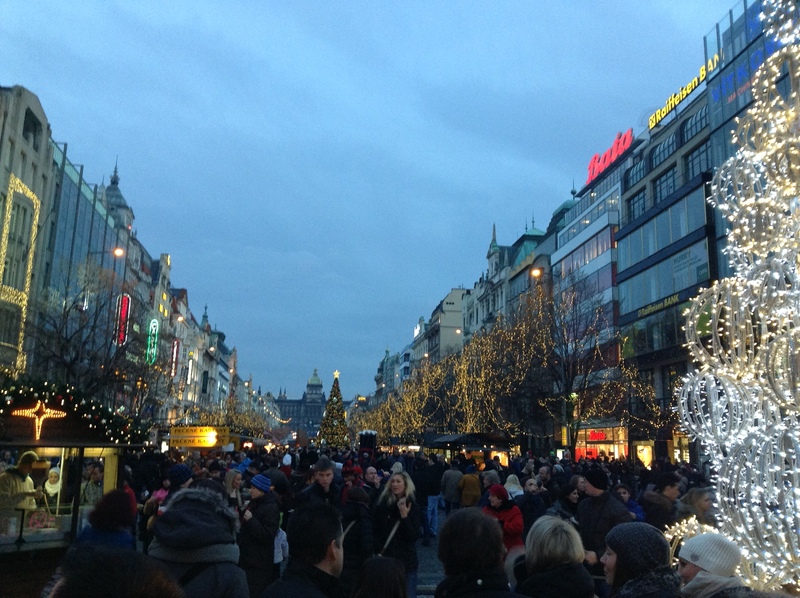 I learned a lot about myself, went through a roller-coaster of emotions, and got a terrible cough in Vienna on Christmas day. I learned a lot about myself, went through a roller-coaster of emotions, and got a terrible cough in Vienna on Christmas day. But if I had the choice- I would absolutely do it over again. I might change the hostel I stayed at in Prague, though.